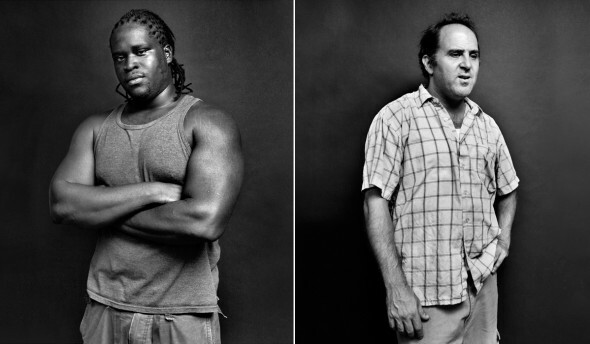 An encounter between Shannon Harper, left, and Keith Miller, right, on the streets of Brooklyn inspired the indie film, "Welcome to Pine Hill." Photo by Jesse Dittmar. 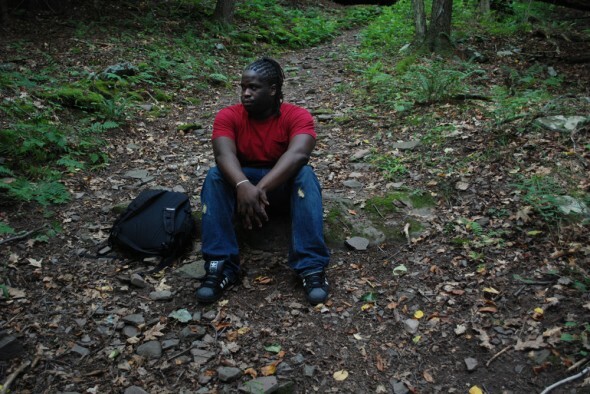 In “Welcome to Pine Hill,” the film that took home the Slamdance Film Festival Grand Jury Prize, a reformed Brooklyn drug dealer receives life-changing news that compels him to make peace with his past and seek freedom beyond the bounds of New York City. Shot in a cinema verité style, the film pulls from the real life experiences of star Shannon Harper, who makes his debut performance playing himself, and filmmaker Keith Miller. MetroFocus spoke with Harper and Miller about how their “only-in-New York” type of first encounter inspired the film and led to an unlikely friendship. Q: Keith, you met Shannon through a chance encounter on the street in Brooklyn. Can you describe it? We had an hour-and-a-half long argument before I realized that I had stolen his dog. What happened was, he couldn’t have the dog because of his personal situation, and so we agreed that I would pay him what he paid for the dog. We were talking until about one in the morning, and I was just wide-eyed and upset all night long. Finally at about three in the morning, I said, this [film] would be a good way to work through this thing. And in the morning when I went to pay him, I asked him if he wanted to make a movie about that situation because I thought it revealed a lot about race and class, ownership and love. 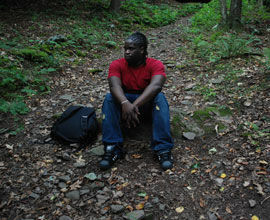 "Welcome to Pine Hill," which is based in part on Shannon Harper's real life experiences, marks Harper's acting debut. Photo courtesy of Keith Miller. Q: Shannon, what convinced you to be the subject of the movie? Harper: After speaking to Keith, I realized that he was a genuine guy. He had no ulterior motives, so I thought it over and realized we could possibly be friends. We shared a moment — I lost something that I loved when I made the decision that my dog would be better with him. We had an animated conversation about it — he wasn’t belligerent, he wasn’t mean or nasty; we actually talked very civilized about it and came to a solution. So when he said he wanted to do the movie, I said to myself, “Why not? This guy seems like a very honest guy, he came to me the next morning and kept his word, he paid for the dog — I could do him a couple of favors.” I actually felt bad for taking the money. I really didn’t want to take it. I actually wanted the dog back! Q: What was it like working together, and how did your relationship influence the film? Harper: From the film, I think our relationship got a lot stronger. We ended up finding out a lot about each other that we didn’t know. When I was shooting with him, we actually became very close, we joked around… it was fun. Keith brought my emotions out for the film — emotions that I haven’t felt in a very long time. He got me to bring those out and share them on camera. Miller: The movie, by design, is a very intimate movie, so I had a pretty close relationship with almost everyone in front of the camera, and in the crew also. We worked with the Brooklyn Filmmakers Collective and some of the crew were former students of mine at NYU, where I teach. Shannon and I became very close, and we’re planning to do another movie. In this clip from “Welcome to Pine Hill,” Harper returns to visit his former dealer friends one last time. Video courtesy of Keith Miller. Q: How much of “Welcome to Pine Hill” is based in reality? Miller: The way we shot a lot of the scenes was with three cameras rolling at the same time, and we did usually up to 45-minute takes, so the idea behind that was to allow as much reality to spill into it as possible. There are certain facts in the movie that are very directly based on my conversation with Shannon, like his former life and his current life, things like that. And other things are put there from my life. I tried very hard to disregard the line between those stories, but also fact and fiction. "It’s really a complex movie, because it’s very contemplative and meditative. 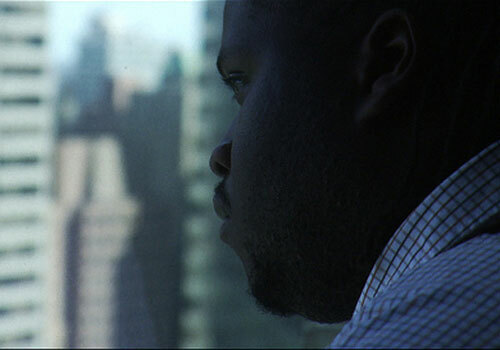 It’s not a gritty urban drama that shows the real side of black life," says Miller. Photo courtesy of Keith Miller. Q: Your first encounter was such a New York kind of thing. How did the city influence the way you made the film? Miller: The initial impulse for the movie was based on race, class and love, essentially. I think we live those ideas very first hand in New York City. You get off one train stop, and you can tell you’re in a Latino section, or a black section, or a white section, or a rich section, or a working class section or a poor section. The subway is a great metaphor for that — you just pop up into a different reality. If you live in a Hispanic neighborhood and you’re not used to it, after your first two nights you say, “God, these people listen to loud music all night long,” and you think, “yeah, you moved into their neighborhood.” People complain about it all the time, but I find that kind of insensitive and somewhat offensive. Q: Was the film shot entirely in Brooklyn? Miller: The film was shot in Brooklyn, Queens, Manhattan and the Catskills. The final section of the movie takes place in and near the town of Pine Hill, twenty five minutes west of Woodstock. Q: Shannon, has making “Welcome to Pine Hill” sparked an interest in acting? Do you think you will continue to pursue movie roles? Harper: It definitely has! As I told Keith, if the opportunity arises, I’d definitely be interested. Especially not having had any experience before doing “Welcome to Pine Hill,” and now everyone’s saying I’m such a great actor. Everyone says I should continue doing it… Why not? A professor at NYU's Gallatin School, "Welcome to Pine Hill" is Keith Miller's first feature film. Photo courtesy of Keith Miller. Q: How does the cinema verité style lend itself to “Welcome to Pine Hill”? Miller: The idea that I had was to really make it feel like the viewer is part of the experience. I think the Hollywood rule is, you’re either advancing plot or character, or ideally, both. I was interested in that, but I was just as interested in advancing mood and sense of place. A lot of the scenes start off without any explanation, like “Oh, we’ve got to go to Janet’s house,” and then you see a house and Janet’s inside and then in walks the main character, and you say, “Oh, I know where I am.” With this, I wanted the sense that you just kind of end up somewhere, and you essentially don’t know where you are, but you still figure it out pretty quickly. Q: What’s next for you both? Harper: Right now, I’m doing my day-to-day job — I do a little bodyguard work and bouncing. I plan on working with Keith in the very near future on another project. Miller: I have one feature script that’s a more straightforward film, and I’m working on another project that’s similar in style and concept to “Welcome to Pine Hill.” The story will follow the leader of a major gang in Brooklyn, and a 12-year-old who is a recent initiate to the gang. The gang leader is ending his time in the gang as he seeks out a way to become a man and a father, and the 12-year-old is just getting into the gang and seeking a way to become a man and avenge the death of his father. Q: Where can we see the film? Miller: We’re going to be having a New York premiere sometime within the next few months. We have to figure out what festival is going to take us and what festival is going to be the right fit for the movie. Hopefully then we’ll get it in theaters and beyond, moving forward. This interview has been edited and condensed by Michelle Michalos, Multimedia Producer, WNET.